Reza Shah the Great, also Reza Pahlavi ( Persian: رضا پهلوی‎ - Rezâ Pahlavi) ( March 16, 1878 – July 26, 1944), styled His Imperial Majesty, was Shah of Persia from December 15, 1925 until 1935, at which time he requested that other countries address his nation by its native name, Iran, and Shah of Iran from 1935 until September 16, 1941. He was the first monarch of the Pahlavi dynasty, and is credited with greatly modernizing the nation. Reza Pahlavi was born in the city of Alasht in Savad Kooh county, Mazandaran in 1878. His father, Colonel Abbas Ali, had been a member of the provincial army. When Pahlavi was fifteen years old, he joined the Persian Cossack Brigade, in which, years later, he would become a commander. He also served in the Iranian Army, where he gained the rank of Gunnery Sergeant under Qajar Prince Abdol Hossein Mirza Farmanfarma's command. He was also one of the last individuals to become an Officer of the Nishan-e-Aqdas prior to the collapse of the Qajar dynasty in 1925. Reza Shah during his time as Minister of War. 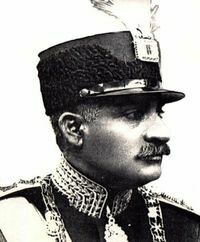 On February 21, 1921, under the new name of Reza Khan Mirpanj (Persian: رضا خان میرپنج), Pahlavi staged a coup d'état together with Seyyed Zia'eddin Tabatabaee. Commanding a Russian-trained Cossack Brigade, General Reza marched his troops from Qazvin, 150 kilometres to the west of Tehran, and seized key parts of the capital city almost without opposition and forced the government to resign. With the success of the coup, Tabatabaee became the Prime Minister of Iran. 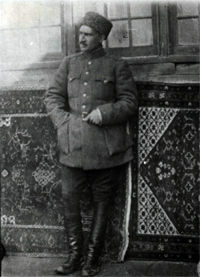 Reza's first role in the new government was as commander of the army, which, in April 1921, he combined with the post of Minister of War. At the same time, he took the title Reza Khan Sardar Sepah (رضا خان سردار سپه). Personal flag of Reza Shah from 1925 to 1964. On October 26, 1923, Ahmad Shah Qajar formally named him Prime Minister, and left to live in exile in Europe. The National Assembly of Iran, known as the Majlis, officially deposed the Qajar dynasty in 1925, four years after the coup had taken place. On December 12, 1925, the Majlis, convening as a constituent assembly, voted to crown Reza Pahlavi as the new Shah of Persia. Three days later, on December 15, 1925, he took his imperial oath and thus became the first Shah of the Pahlavi dynasty. However, it would not be until April 25, 1926, that Reza Shah would receive his coronation and first place the Imperial Crown on his head. At the same ceremony, his son, Mohammad Reza Pahlavi, was proclaimed the Crown Prince of Persia – to rule after his father. 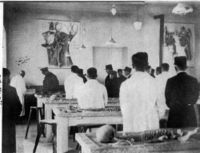 During Reza Shah's sixteen years of rule, major developments, such as large road construction projects and the Trans-Iranian Railway were built, modern education was introduced and the University of Tehran was established. The government sponsored European educations for many Iranian students. Under Reza Shah's watch, the country changed its name as well. According to The New York Times, "At the suggestion of the Persian Legation in Berlin, the Teheran government, on the Persian New Year, March 21, 1935, substituted Iran for Persia as the official name of the country. It has been suggested that this decision was the result of the Nazi revival of interest in the so-called Aryan races, cradled in ancient Persia. As the Ministry of Foreign Affairs set forth in its memorandum on the subject, 'Perse,' the French designation of Persia, connoted the weakness and tottering independence of the country in the nineteenth century, when it was the chessboard of European imperialistic rivalry. 'Iran,' by contrast, conjured up memories of the vigor and splendor of its historic past." The very name “Iran” means “Land of the Aryans”. At the expense of religion, the Shah backed a strong policy of industrialization to ensure that the country was not dependent solely on its fossil fuel reserves and agricultural revenues. While Persia was once an advanced empire, the Iran of the early 20th century had become technologically backwards compared to the Western world. The Shah's new policies helped his country enter modern times. Though his achievements were great, by the mid-1930s, Reza Shah's constructive, but dictatorial style of rule had caused intense dissatisfaction to the Shi'a clergy throughout Iran, thus widening the gap between religion and government. He forbade photographing aspects of Iran he considered backwards, like camels, he banned Iranian dress and chadors in favour of Western dress. Women who resisted this compulsory unveiling had their veils forcibly removed. He dealt harshly with opposition: troops were sent to massacre protesters at mosques and nomads who refused to settle; newspapers were closed and liberals imprisoned. He also used his power to vastly increase his fortune, becoming the biggest landowner in Iran, proprietor of nearly three thousand villages, as well as many factories and enterprises. During World War I, Britain had ignored protests from the Qajar rulers and stationed troops in the province of Khuzestan. When World War II began, the United Kingdom again wished to station troops in Khuzestan. Reza Shah had declared Iran neutral so it could reconstruct Iran as a modern state without having to deal with the Soviets and British, whom the Shah feared had plans to seize control of the country and its resources. Having previously declared neutrality, Reza Shah protested against this challenge to central government authority. Britain interpreted this refusal as favouring Nazi Germany, especially as the Shah refused the Allies the right to use the trans-Iranian railroad used to transport Western supplies to Stalin. Fearing that Reza Shah was about to align his petroleum-rich country with Nazi Germany during the war, the United Kingdom and the Soviet Union occupied Iran and forced Reza Shah to abdicate in favour of his son (see also Persian Corridor). The Shah's son, Mohammad Reza Pahlavi, officially replaced his father on the throne on September 16, 1941. Reza Shah soon went into exile, first to Mauritius, then to Johannesburg, South Africa, where he died on July 26, 1944, aged 66. After his death, a mausoleum was built in his honour in Iran, where his body was buried. His son later designated the title "the Great" to be added to his name. Following the Iranian Revolution in 1979, Reza Shah's mausoleum was destroyed under the direction of Ayatollah Sadeq Khalkhali, which was sanctioned by Ayatollah Ruhollah Khomeini.